Palma de Mallorca, 7th of June 2017 – ‘Wine to me is passion. It’s family and friends. It’s warmth of heart and generosity of spirit. Wine is art. It’s culture. It’s the essence of civilization and the art of living.’ -Robert Mondavi. The flavour, the colour the body and the sensation when the first droplet touches your tongue. Wine is one the delicacies in life that brings people together, it represents regions of our world and it is a piece of art, stored away for years and maturing over time. The flavours will change as you pass from one region to the other, crossing borders, seas and climates. Each variety of wine is influenced by the land the grapes are grown on, the ripeness of the fruit and of course the time it has been matured for, allowing it to develop additional layers of complexity. Hundredooms the holiday rental search engine has chosen to not only focus on the body of the wine itself, but the spectacular wineries across the world where some of these iconic wines have been created. These magnificent wineries have been designed to overwhelm your senses, not only with their rich fruit flavours but also what you see. 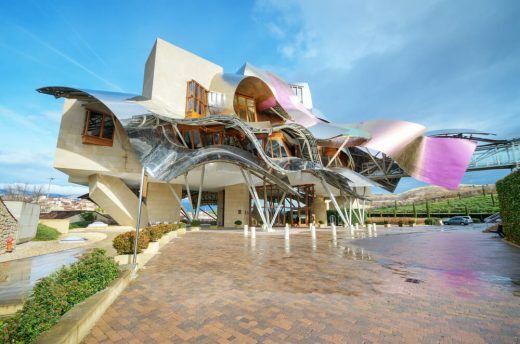 This striking structure located in the City of Wine is one of the most prestigious hotels in Spain, as well as the site of the Marques de Riscal wine. Set in the heat of the wine cellars, this innovative design has brought to life the traditional stone build cellars through combining tradition with the most modern of materials. 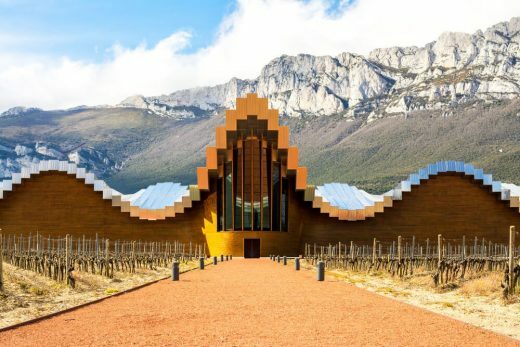 Designed by the Canadian architect Frank O.Gehry, this staggering landmark is one of the most ambitious projects in the history of the Spanish wine industry. 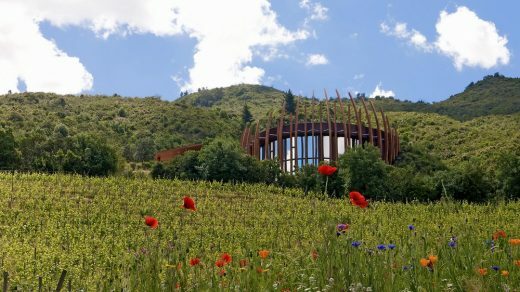 Within this complex landmark, there is the opportunity to experience the culture and art of wine in a unique setting, while retaining the purest and most natural methods of production. Petra winery was a vision, a dream, a project and a promise. It was a niggling voice in the head of Vittorio that turned into a realisation through a philosophy followed by his daughter. The rolling vineyards of Tuscany are seductive, rich and inviting, while home to a hardy soil that produces the wines of Petra. 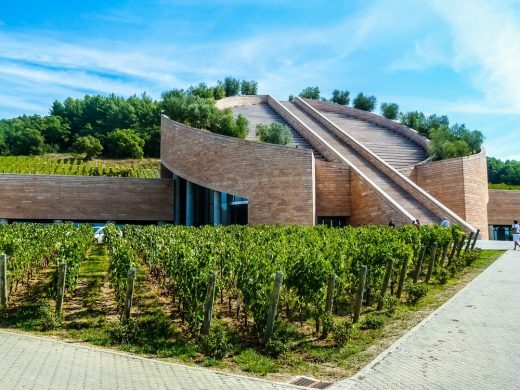 The winery on this plot of land, that is protected by the hills, was designed by a famous Swiss architect named Mario Botta. 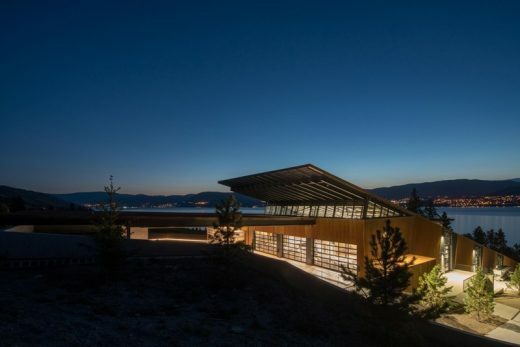 The structure uses a natural colour scheme that compliments the surrounding environment while its sweeping lines blend in with the rolling mountains that frame it. The building drops 500 feet below the ground where there have been state of the art cellars built to house the high end wines. 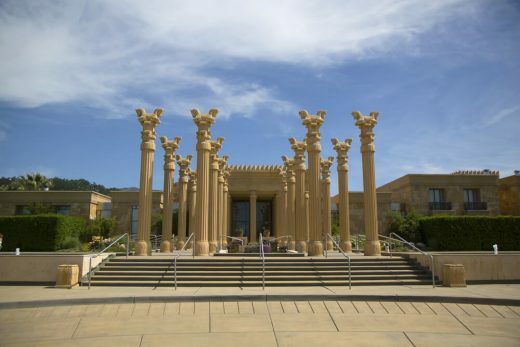 A Persian Palace set in the Napa Valley, amongst the natural beauty of both nature and man, sit the Darioush Winery. The structure of the building alongside the romance of the wine creates a fabulous display of design, culture and body. Eighteen Foot freestanding columns proudly welcome visitors at the entrance of the winery, while a yellow stone stone cladding surrounds the entire building giving it that mystic appearance. The winery was founded by Darioush Khaledi who grew up in one of Iran’s prominent wine growing regions before he moved to the Napa Valley. 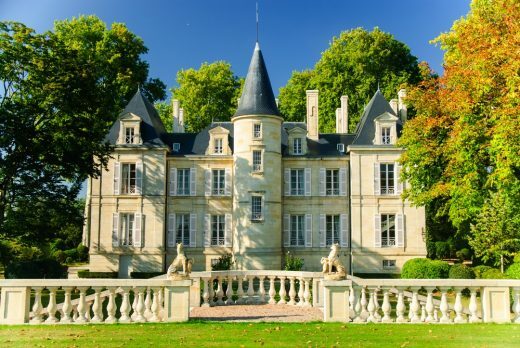 A fairytale setting in the heart of the Bordeaux region, this illustrious winery and the splendour of this chateaux is home to wine of the utmost elegancy. The prominent spirals that fasten together the sides of this impressive structure in such eloquence., tower over the lawns below. The picture perfect garden that is overlooked by the Chateaux is perfectly pruned, fit for a princess. The intense and profound views from the outside of this spectacular winery, are matched in their most prestigious wines, a sensory experience in many forms. Like a nest perched on the hillside amongst the thick green vegetation, blending into the natural appearances of the environment. The 24 surrounding beams on the face of the piece of architectural splendour represent the 24 months that it takes to produce the extraordinary wine. The sundial that is perched on the roof the structure comprises of 5 granite stones, each representing the yearly biological cycle of the wine: shooting, flowering, fruit set, veraison and harvest. Panoramic views of fields filled with wild flowers and gently rolling hills can be seen from the winery. At the foothill of Laguardia, this chic structure that almost reflects the mountains in the backdrop is a truly magnificent piece of architectural design. Tremendous bars of aluminum make up the structure of the roof, working harmoniously with the grey colours of nature, seamlessly fitting into its surroundings. The buildings main body is comprised of copper stained cedar, representing the that of the giant wine barrels. 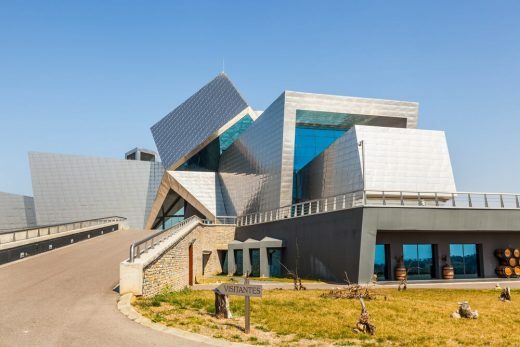 Something more than a winery, this impressive structure overlooks the lands of Somontano. Sharp steel edges that reflect under the midday sun, interlaced together in the form of giant cubes. 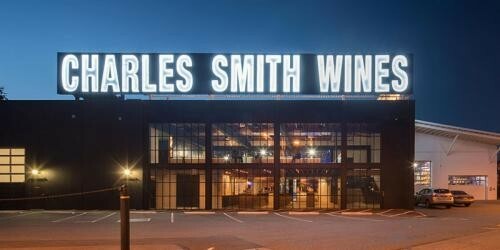 Not only a winery, but a cultural object, this structure has been perfectly integrated into its environment. With such hard materials being used, its unique strength dissolves harmoniously into the land surrounding it. 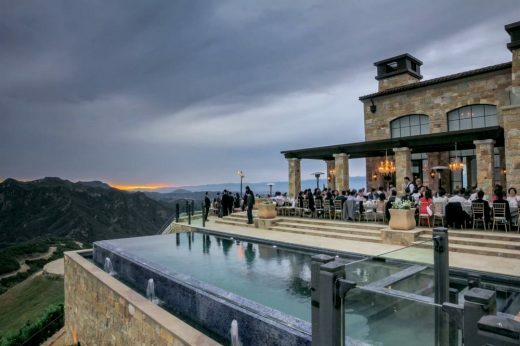 Not only does this Tuscan style winery house a helicopter pad, infinity pool and a vineyard, it also features impressive 360 degree views over the rolling hills and ocean. 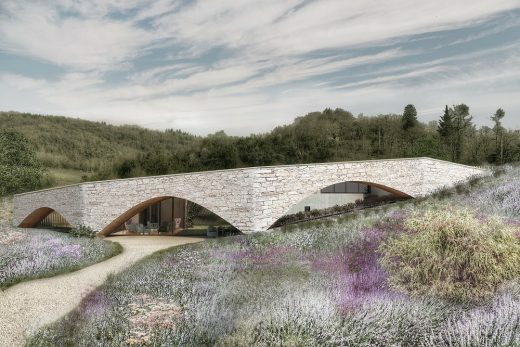 The home was designed by Architect Bob Easton and is situated at the top of the hill overlooking the vast vineyards below that consist of 10 planted acres. On some days, the vineyard sits above the clouds, overlooking them as the gently float past below. Hundredrooms is an online comparison website of holiday homes and apartments. It was founded in early 2014 in response to the exponential increase in demand for this type of alternative accommodation. In a single search, Hundredrooms allows consumers to check and compare property prices on all leading vacation rental websites in a few seconds.